I’ve got to admit, I love it when designers package a complete outfit tidily into one gift box. Don’t get me wrong, finding freebies and creating new looks is definitely an obsession for all of us at All Spiffed Up. However, every so often it’s simply nice to just open a box, wear its contents, and hit the grid. For me, it’s the Second Life version of taking a day off from bed making. Thanks to Nala Designs we can all have a lazy dress day in a brand new outfit. The box includes the fringe halter, jeans, heels, and necklace. The skinny jeans are sized for classic, Maitreya, Slink, Belleza, and TMP bodies. The halter comes with a fitmesh and Slink Physique model, plus 5 standard sizes. The heels are sized for Slink, Maitreya, and Belleza feet. This outfit can be found in the far right corner of the store. It is a gift for Fabulously Free in Second Life group members, so you’ll need to join the free group. Nala supports many other free shopping groups. The shopping group gifts are dotted around the store, one in each room. In this closeup the gold necklace included with the outfit is visible. Today’s sassy hairstyle is a “functional demo”, or more aptly a free sample from the marketplace. It comes in the one shade, black raspberry, and is yours to wear indefinitely. Be sure have a lengthy browse through Alli&Ali Design’s other styles, there are lots of interesting freebies in their marketplace store. Finish off today’s look with another marketplace freebie from Zibska. This fantastic eyeshadow set can be worn by everyone! The box is packed with appliers galore and system tattoo layers. Halloween look #7 is based on Margo Robbie’s portrayal of Harley Quinn in Suicide Squad. Thanks to the wonderful gifts gathered from several designers we were able to capture the essence of the character. The smudged Harley Quinn makeup is a freebie from LV Designs. It’s an applier only set. Though it was created for the Bimbo mesh head, it’s an Omega applier and worked perfectly on our model’s non-Bimbo head. To capture Harley’s smile we did make two mods to our mouth shape. First, we widened the mouth width, and then we increased the corners upward slant. No Cabide’s Harley Quinn Set is a complete outfit-in-a-box. The top, shorts, and garters are sized for Maitreya, Slink, and Belleza mesh bodies. Appliers for the socks are also included. The collar and shoes are unrigged/resizable. The body tattoo is a marketplace find from Isuka Tattoos. This gift comes with both tattoo layers and mesh body appliers. 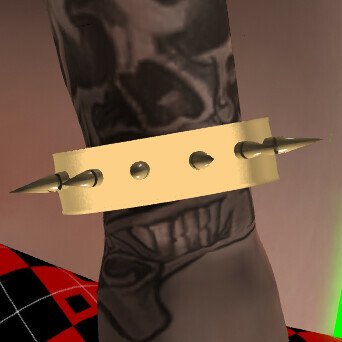 Completing the look are two great items from Blackburns marketplace store: Spiked bracelets, and the bat. The bat is unscripted and can be worn on either the right hand or back. It comes with a Crazy HUD that includes dances and swings. This is really a fun gift. Thanks Blackburns! Here’s a closer look at the shoes and socks. Happy Weekend everyone! It’s time to head on over to Legendaire. Once again the creators at Legendaire have temporarily set their group join fee to 0L. So if you have not joined yet, now is the time! Legendaire has sent several members of team All Spiffed Up into a freebie collecting frenzy. Not only have they reduced the group join fee, but, and this is a biggie, they have put out loads of GRRRRRRREAT group gifts. Since we’ve been shopping at Legendaire there are always two free gifts at the main entrance. The gift to the left is a free gift for the group SLF & O. Which of course happens to be free to join. On the right is the free with a capital “F” gift. What do we mean? Simple it is a gift that anyone can take without having to join a group. Iona actually popped by Legendaire to model those two freebies for today’s blog when she discovered it’s a free group join weekend with tons of bonus group gifts. Iona’s glasses and earrings are wonderful gifts that can be found at Since 1975. The wall of freebies combined with a 0L group join fee make Since 1975 a worthwhile stop. Makeup, tattoos, bangles, and the necklace can all be found in the Second Life Marketplace. The bangles and necklace are copy/mod which allowed Iona to intensify and change the colors to suit her outfit.